Middleboro, Mass.”, Vol. XLIV, No. 25, December 22, 1915, 473+. The concrete water tower which formerly stood at the crest of Barden Hill was an engineering landmark, being the first of its kind as well as the tallest reinforced concrete water tower when it was constructed. In part due to these reasons, the tower was listed on the National Register of Historic Places as part of the Middleborough Water Works Historic District in 1990. 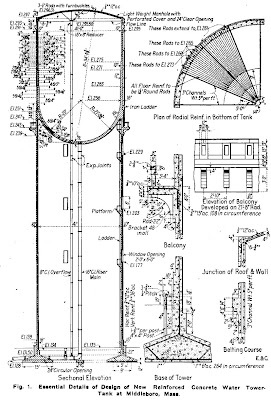 What follows is a description of the Barden Hill water tower published immediately following its construction. Though somewhat technical in places, the article well documents the tower's construction, as well as its engineering significance. The present article describes the design features of and methods of constructing the highest reinforced concrete water tank yet built. This structure, which has a capacity of 500,000 gals., was recently built for the city of Middleboro, Mass. The tank has a hemispherical bottom and is supported in a cylindrical tower. The total height of the structure is 172 ft.
Local conditions required the storing of 500,000 gals. Of water at an elevation sufficient to meet the combined demands of domestic and fire service. The most economical type of structure fulfilling the requirements was a tower-tank, an elevated tank supported on a tower, and the only practicable materials for building such a structure are steel and reinforced concrete. A steel tower-tank was estimated to cost about $2,000 less than one of concrete, but the cost and inconvenience of frequently painting it inside and outside, a safe life of not over 30 years, its unsightly appearance, and other considerations made it apparent that if a satisfactory watertight concrete tank could be constructed it was greatly to be preferred to a steel structure. The difficulties, however, of designing and building such a structure, especially of the proportions required, were many and vital. The success or failure of a reinforced concrete water tower-tank, perhaps more than in any other engineering structure, depends to a large degree upon each individual connected with the work from the time the concrete materials are selected until they are placed. With due regard for the difficulties involved it was decided to build the concrete structure here described. The essential details of the design are shown in Fig. 1. Foundation. – The foundation extends 7 ft. below the finished grade and rests upon a fine, well compacted sand, the safe bearing power of which was determined experimentally by loading a timber set at the elevation of the bottom of the foundation. At a loading of from 1 to 3½ tons per square foot, the settlement was uniform and slight, being only 1/32 in. for each additional ½ ton; but 4 tons per square foot produced a relatively large settlement – 5/32 in. for the last ½ ton. The footing area is such that with the total dead weight of 4,485 tons the soil is compressed to the extent of 2.38 tons per square foot. The wind load was computed from an assumed velocity of 70 miles per hour, the equivalent of 30 lbs. per square foot on a vertical projection of the structure, which with a full tank adds a maximum of 0.68 tons, thereby giving a total maximum pressure of 2.96 tons per square foot. Although the resultant of the wind pressure is slightly more than doubled with an empty tank, it is more than offset by the reduction in the dead-weight of the water, so that the maximum mentioned represents the worst condition. Tower. – A cylindrical tower was adopted in preference to a number of columns, because structurally it seemed a safer type of support, would probably be more economical to construct and could be made to present a more pleasing appearance. Considerable study was given to the architectural side of the problem in order to produce a moderate cost a structure that would be, to some extent at least, an addition to the landscape. The completed structure is shown in Fig. 2. The plain aspect of the simple cylinder is relieved by the addition of twelve 4 x 24 in. pilasters, which were assumed to take their proportion of the load. The appearance of solidity at the bottom is accomplished by a concrete seat extending around the base of the tower. A balcony of reinforced concrete with bracket supports, paneled posts and railing, the floor of which is 108 ft. above the ground, furnishes a suitable point of vantage for inspecting the outside of the tank and provides a visual starting point for the tank proper. The thickness of the tower wall between the pilasters is 10 ins. And the greatest compression due to the dead load is 483 lbs. per square inch, increased to 631 lbs. by a 70 mile gale. Entrance to the tower is through an iron door. Light and ventilation are provided by means of twelve windows, three of which are arranged to open. An iron ladder within the tower leads from the ground to the balcony through an opening in the wall of the tower at the elevation of the balcony floor. Another iron ladder on the outside of the tank connects the balcony with the roof above. A 16-in. cast-iron flanged pipe with expansion joint, rises from the ground and enters the tank at its center. A 8-in. overflow and drain discharges at a safe distance from the tower. Tank. – The tank proper, 41 ft. in inside diameter and having a depth of water at its center of 59 ft., has a capacity of slightly over 500,000 gals. The bottom of the tanks is a hemispherical bowl hung at its rim from the wall of the tower, and marks the first application of this type of bottom to an elevated concrete tank, although for many years it has been used with success in elevated steel tanks. The bowl itself has a capacity of 125,000 gals. The vertical wall of the tank varies in thickness from 10 ins. At the top to 16 ins. At the bottom and the hemispherical bowl from 18 ins. At its connection with the tank wall to 14 ins. At its center. The thickness of concrete is such that without any assistance from the steel reinforcement its stress in tension is about 250 lbs. per square inch. The tensile stress in the steel acting independently is approximately 14,000 lbs. per square inch; and with both materials acting in conjunction the computed stresses are 215 and 2,150 lbs. The tanks is covered to guard against the growth of algae, not uncommon in a filtered water supply exposed to light, and to prevent freezing. The roof is a concrete dome 4 ins. Thick, 41 ft. in diameter and with a rise of 4 ft. at the center. The thrust is carried by steel reinforcement embedded in the top of the tank wall. Concrete. – Whitehall cement from the Whitehall Portland Cement Co.’s mill at Cementon, Pa., was used throughout the work. Sampling and testing was done by the New England Bureau of Tests of Boston, samples being taken as loaded on the cars which were then sealed. The tests of the 12 carloads required, aggregating 8,100 bags, were unusually uniform and satisfactory, especially for the essential qualities of strength, fineness of grinding and slow initial set. The sand and coarse aggregate were obtained from a gravel pit about 1¼ miles distant, screened by hand at the pit to give the sizes required. The sand was tested for tensile strength as compared with standard Ottawa sand and gave an average of 112½ per cent thereof. The gravel stones were washed to remove a slight coating of clay and cemented sand. The proportions of the concrete for the foundation are 1 of cement, 2½ of sand and 5 of gravel stone; for the tower 1:2:4; for the hemispherical bottom and wall of the tank to elevation 279, 1:1:2; from elevation 279 to 293, 1:1½:3; and above elevation 293, including the dome roof, 1:2:4. The relative amounts of sand and stone were somewhat varied to provide the densest practical mix, the percentage of cement to the sum of the aggregates, however, remaining as stated. The amount of concrete used in the work was 1,120 cu. yds. Steel Reinforcement. – “Havemeyer,” round, deformed, open hearth, hard grade reinforcing rods furnished by the Concrete Steel Company of New York, and bent at the rolling mills, were used in the structure. These were tested at the Carnegie mills by the New England Bureau of Tests, a large proportion of which were 1¼ in. and developed an ultimate tensile strength of 120,000 lbs. per rod. Laps were 40 diameters and in addition each joint in the tanks was secured by two cable clips. The horizontal rods of the tank were firmly secured in their true position to 16 vertical 3-in. channels drilled to the exact spacing for the rods. A total of 160,000 lbs. of steel reinforcement were embedded in the concrete. The foundation reinforcement is shown in Fig. 3 and the reinforcement in the bottom of the tank in Fig. 4. Forms. 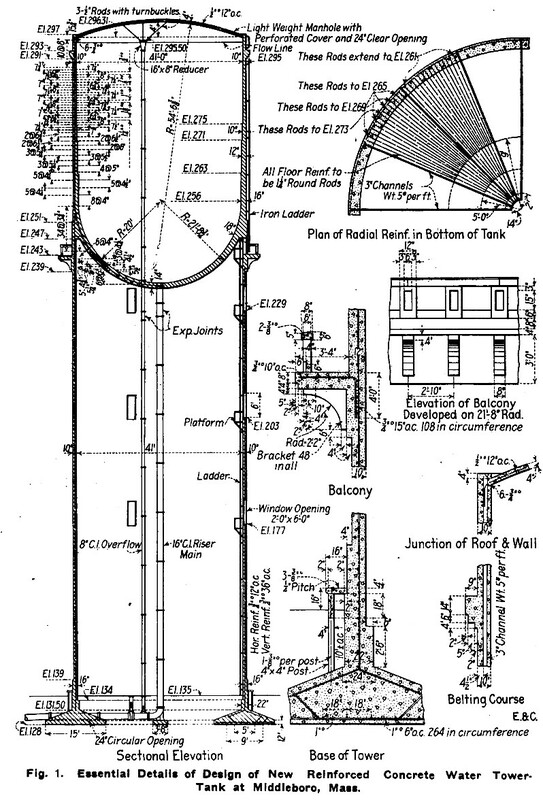 – Steel forms made by the Blaw Steel Construction Co. of New York were used for the outside surface of the tower and tank, as shown in Fig. 5. Two complete rings were provided, each 4 ft. in height, at a total cost of $600. Two 4-ft. rings of wooden forms were used in the inside at a first cost of $400. The use of steel forms was justified both on account of a considerable saving in time and expense in erection and because of the resulting smooth, dense surface, requiring very little finishing and less susceptible to the action of the elements, The hemispherical bottom was cast between forms consisting of wooden ribs covered with sheet iron. Joint Between Old and New Concrete. – For the tower, in order to secure a bond between the successive rings of concrete, the forms were overfilled about ¼ in., which surplus containing the laitance was screeded off previous to the initial set of the concrete, following which as soon as the final set occurred the surface was wire-brushed to expose slightly the stones and immediately before placing fresh concrete, washed with a hose stream and coated with a neat cement grout. For the tank, in addition to the above precautions which were carried out with especial care, , there was cast in the old concrete a continuous triangular groove, about 1½ ins. In depth, running around the wall near its center and subsequently filled with grout and concrete; to still further minimize the chances of leakage at each horizontal joint an uncoated steel plate or dam of No. 14 gage metal 10 ins. Wide, turned over 1 in. at each edge to form a channel and bolted together to form a continuous watertight stop, was embedded 4 ins. Into the old work, thus leaving 4 ins. Extending up for a bond with the new concrete. The cost of 12 channel rings in place was about $400. Progress of Work. – Ground for the foundation was broken on April 26, 1915. After the excavation was completed the earth was wetted and thoroughly compacted by rammers, following which a 2-in. layer of concrete was placed over the entire surface to serve as a working base for the erection of the steel reinforcement and as a suitable medium upon which to place concrete. All concrete was mixed in a 15 cu. ft. Smith mixer operated by steam and discharging into a bucket elevator which at the desired height was tripped and dumped into a receiving hopper, whence it was conveyed by gravity through a sheet steel chute to a central distributing hopper, and finally by means of eight movable wooden chutes was deposited between the forms around the circumference. A view of the concreting plant is shown in Fig. 6. The concrete materials were brought to the mixer in dump cars running on an inclined industrial railway and pulled up the incline by a cable attached to a drum of the hoisting engine. The average rate of progress on the tower was a 4-ft. ring each alternate day, with a marked increase in efficiency as the work advanced. The actual time required for concreting was about 4 hours to each 4-ft. section. The bottom of the tank, including 4 ft. of the wall immediately above the tower was poured continuously. Concreting began at 5 a. m. on Sept. 9, and the last batch was deposited at 4 a. m. the following day, during which time about 130 cu. yds. Of 1:1:2 concrete were placed. Five days elapsed before the following section was in place and two more days before the succeeding ring was concreted. Four days were then spent in preparing for future operations, so that when concreting began again on the fifth day, the following eight successive lifts were made in nine days and it was only due to a violent gale of about 70 miles per hour that operations had to be suspended for one day. The roof of the tank was poured on Oct. 13. The concrete in the bottom and wall of the tank shall be substantially water tight at all times. Any leakage amounting to jets or visible seepage shall be repaired by and at the expense of the contractor and by methods approved by the engineer. Small damp spots, if few in number, which do not increase nor disfigure the appearance of the concrete, will be considered to meet the requirements hereunder. It is intended that the work shall be sufficiently waterproof that severe freezing will not at any future time threaten the integrity of the concrete and that the general appearance of the structure will not suffer through efforescence or other disfiguring stains. The work, including grading and cleaning up, is now completed, and it is hoped that water may be turned into the mains on January 1. The static hydrant pressure with a full tank will be 84 lbs. in the higher residential area, 104 lbs. in the low district along the Nemasket River, reduced by about 20 lbs. by frictional losses during an ordinary fire. For the year 1914 the population supplied with water was 5,000 and the average daily consumption was 320,000 gals., so a storage equal to a 36-hour demand is provided by the new tank. The structure here described was designed by Mr. George A. Sampson, Civil Engineer, Boston, Mass. The contract was executed by the Hennebique Construction Co. of New York City. The contract price was $23,140. Mr. Thomas F. Dorsey, representing Mr. Sampson, was resident engineer in direct charge of the construction work. Mr. Alvin C. Howes is chairman of the Board of Water Commissioners and is Superintendent of Water Works at Middleboro. The information here given is from a paper by Mr. Geo. A. Sampson before the December meeting of the New England Water Works Association. Engineering and Contracting, “Design and Construction of World’s Highest Reinforced Concrete Water Tower-Tank, Middleboro, Mass.”, Vol. XLIV, No. 25, December 22, 1915, 473+.